There are many reasons why RVers prefer using solar panels instead of generators or campground hookups. It’s not only more eco-friendly, but solar power enables us to boondock off the grid away from crowded RV parks. A large variety of solar panels are available for all budgets and power needs. Here’s why we recommend using portable solar panels to power all of the essentials in your RV. 1. You won’t need to run wires or drill holes in your roof. Portable solar panels are relatively easy to set up even if you don’t have much experience. 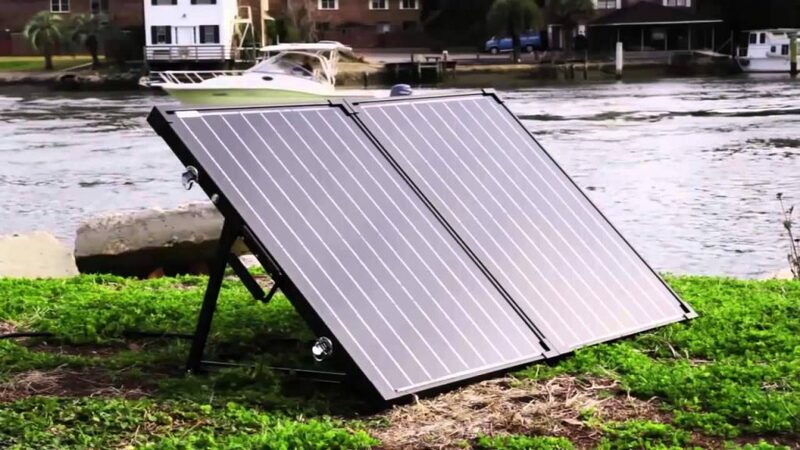 The popular brand Renogy makes suitcase-style folding solar panels with charge controllers that can connect to your deep cycle batteries within minutes. Acopower’s portable solar panel also has USB outlets to charge electronics like your phone and laptop. 2. You can get power while you’re parked in the shade. The last place you want to park on a hot day is a campsite with no shade. However, if you’re relying on your rooftop solar panels for power, this is usually necessary in order to get enough sunlight. Portable solar panels can be simply taken out and set in direct sunlight while you’re parked under some nice shady trees. Staying out of the sun will also help protect your RV from UV damage. 3. They don’t take up a lot of space. Many smaller RVs like Class Bs and camper vans don’t have a lot of space on the roof for a big solar panel setup. But chances are there is a place inside your RV that can fit a foldable solar panel. They can be stored anywhere from under the bed to inside cabinets when they’re not in use. This will also open up your roof space for other gear like kayaks or surfboards. 4. Maintenance is almost effortless. If you have rooftop solar panels, you’ll occasionally need to climb up and wipe off snow or dirt that’s accumulated to keep them in good working condition. Portable solar panels are even easier to maintain and they do not require accessing the roof at all. 5. They can easily be moved to a new RV. When you get a new RV, there will be no hassle in moving your solar panels since they’re already transportable. They’re as simple to move out as the rest of your items. You can find quality portable solar panels made by Renogy, Acopower, and Eco-worthy. If you already own rooftop panels, check out this easy mod from Do It Yourself RV on how to make them portable. I have had solar and its a great idea, but boondocking is a different story unless the temps are cooler. You can run your AC on some good quality batteries like Odyssey batteries, I have and it works. You are going to need enough solar to fully recharge daily, that is the key. I do recommend solar for all RVs but need to help clarify a couple of points. Drilling holes to mount the panels is a thing of the past. the new 3M double sided tapes work well and have been proven over many miles. years and applications. The convenience of having panels mounted by far outweighs the portability IMHO. The amount of charge the newer panel deliver in shade is much higher than in the past. What power is minimum for charging dual-6-volt batteries? What is the restore time and loads possible while under a charge? You need to know that amp-hour capacity of the batteries and the amps (or wattage) available from the panels. Many systems use dual 6-volt “golf cart” batteries in series to get 12 volts, and often will parallel sets of those to expand capacity. Most “golf cart” batteries are rated for 200-225 amps and are considered discharged at 50% so 100-112 net amps of charge would be needed to replenish. It’s “net amps” because loads applied while charging are deducted. So, assuming the batteries needed 100 amps to charge in an 8-hour daylight period while drawing 15 amps to power loads, you would need 27.5 amps of charging or maybe 365 watts of solar at 90% efficiency. That’s why people try to shed as many loads as possible and maximize the sunlight and angle of the panels, both things that might be easier with the article’s portable panels. Depending on your configuration and loads, it can take a little to a lot of solar watts to actually make a difference. Our rig came with a 100 watt panel, which wasn’t even enough to keep the batteries up when in storage with most everything off. While the reasons noted are generically true, they certainly aren’t absolute. We have upgraded our solar twice over the years and now have 960 watts installed, charging 8 house and 3 chassis batteries. We can live on those indefinitely— as long as we have a good 8+ hours of charging per day and don’t need air conditioning, microwave, coffee maker, hair dryer and curling iron, etc. But I could always use a couple of portable setups to add to the mix! I’m all for solar- BUT- where I camp 90% of the time is very shaded and I’m just not willing to leave hundreds of dollars of solar panels out on a long wire somewhere in the sun for the taking. I have just ordered a 100w Renogy super flexible panel to play with and hope to get some use out if it- but unfortunately in the Smokies the generator is still a necessity. Maybe one day hi-cap lithium batteries will become affordable where one can camp for days without charging or toting around 1/2 ton of batteries. I don’t think portable solar panels are a good idea. Your thief would likely be another RV’er that’s getting ready to leave the campground or some visitors that came into the campground to see some friends.and are leaving. You could set up a motion sensing camera pointed at the solar panels, but chances are you still won’t get them back and will have a nice video of them being stolen from you. Since you have to bring them with you anyway, and they add extra weight anyway, why not put them on the roof. Solar panels are not light to carry, especially as you get into your retirement years! And if you do sell your RV, foof solar panels is a plus for buyers looking for used RV’s. Some good points. We do what we can to protect our equipment. Bottom line— if someone wants them, they will take them even if they are on the roof or otherwise secured. We had 6 of those plastic leveler blocks stolen while we went for 20 minutes to dump our tanks just 1/4 mile away. I have been using one of the Renogy “Suitcase” panels for the past 2 years to help keep my coach batteries up to charge. The coach batteries run the lights and fans. I am also a ham radio operator and I run my radio on those batteries a good part of the time. The generator is still a good backup system and can be used when necessary. I have a permanent connector on the motorhome that makes it easy to set up and the panel does a good job. Yes, you have to get them in the sun and even move them on occasion but that is not too hard to do. I always take the panel down and put it in the coach if we are leaving even for a short time. I try to place it where I can see it and I run a security cable through the panel and lock it to the motorhome, tree or picnic table. I put the cable through both the handle and the frame. I have a 25 foot cable and it seems to work in most situations. It at least discourages someone from just walking off with it. I also have Renogy solar panels installed on the roof of my RV that charge a completely separate bank of batteries. This system is used for the TV and Blue-ray player. It also is my power source for my C-pap device. It works great and I have yet to run out of power. One thing to remember – The solar panel is just one part of the system. Invest in some good AGM/Gel cell deep cycle batteries to make a good system. It is worth the extra money. 1. Glass and crystal silicon modules last longer and make more power per square foot than do flexible thin-film types. Jusat check the warranties, most glass modules give 25 years (if trhe maker is around that long!) but flexable panels are often 5 years or less. 2. Many customerts report tripping over the wires when pakels are not mounted on the roof, and that sometimes flips the panels face down, some crack on a rock. Ok, those are the good glass panels that can be broken that way. Thinking about joining the lifestyle and trying to get as much info before commiting. So on the subject of solar, as i understand it, panels charge batteries and appliaces, etc run on those batteries, rigth? So would it be fair to say that one would need to find out the power needs to run the whole (a/c, refrigerator, lights, tv, computer microwave, etc) n order to buy the appropiate number of panels and batteries? Or is solar always a part time thing? Chas you are right. But there are so many variables that enter into it like insolation (How much sun is in your location on any given day) and loading. Storage: We have taken to position that a reasonable amount of solar panels, will top up batteries while stored as long as not covered with snow. If they don’t while all power is off then look for an issue with the Panels, charger or aged/bad batteries. Load test the latter. In Use: They also top up batteries to operate overnight with a *required* load. In cold climes this means a few LED lights, propane powered furnace, propane powered fridge and little else. For most of us this means 200-250W of panels: that is 2 or 3 panels depending upon their size. We only have a 34’ gasser and this works fine when you are not in the trees or in cloudy circumstances..
More is usually better. We had portable ones for a short while; they are now on the roof. They just too much hassle installing every time, they are at high risk for damage and theft, plus reconnecting every time puts stress on the wire and plugs. Many have installed extra batteries with a huge weight penalty, and these are best sorted with more panels to keep them topped up as typically these are higher demand circumstances. I would never expect to run anything else such as A/C and Microwave from this. There is no doubt the solar panels have hugely improved our enjoyment of the great outdoors. where do you store these portable panels when traveling? To be really useful I think you need a minimum of 500 watts, that is at least two large panels, about 40×75” with a weight around 40lbs each, not simple fold and put away. We have 500 watts, on the roof, 4 GC batteries and we can run most everything on solar, including a residential refrigerat, but not a/a, micro, toaster. We use about 100 ah per night and on a good sunny day they will be recharged by 11:00 am.. on bad days the generator fills in. I have the Renogy suitcase 100 watt portable (as pictured above). A life saver. Here in the east, most of the dry campgrounds are in more wooded areas. It comes with a 15′ cord, as I have made extra cords of 10′ and 15′ just in case I need the length to reach the sun. #2 The angle the panel is related to the sun will greatly increase the input of your solar panel. Moving the portable panel maybe 6″ will increase the input by 40-50%.. There are so many positives in a portable solar unit over a roof mounted set up. BUT, only if your in need of 50-200 watts. If your power needs are 600-3000 watt of solar area to run AC units, roof mount is the only way to go. This was the 3rd summer using my Renogy 100 watt suitcase unit, including a 110 day trip to Alaska in 16′. . I do have my eyes on their 200 watt suitcase unit. But a little pricey ($569) at this time. Why is it so many “just getting into” solar, have never even PAID an electrical bill, much less actually looked at it? I have done an energy audit, and I have concluded our needs to be 1.2K in panels (our wires will be marked and signs will headlined “Break our panels, no barbecue for you.” The thing I fear the most are middle-school-aged kids. I cannot stand them and will chase away any kids I deem to be vermin. Most of them are. No, I never had kids of my own. Any other questions?